Cruise Canyon Lake for 90-minutes aboard Dolly Steamboat. This narrated cruise explores a slot canyon. Keep your eyes open for long horn sheep and eagles. Venture east of the Valley, deep into the Sonora Desert, along the Apache Trail. The Southwest and northern Mexico are the only places on earth where this lush desert exists. Visit Tortilla Flat, a former stage coach stop, which boasts a population of 6 people! There will be some browsing time here. Take a short walk into the desert where your guide will point out the desert plants. Departs on Tuesdays and Thursdays from most hotels and resorts in Phoenix, Scottsdale, Tempe and Mesa, Arizona. 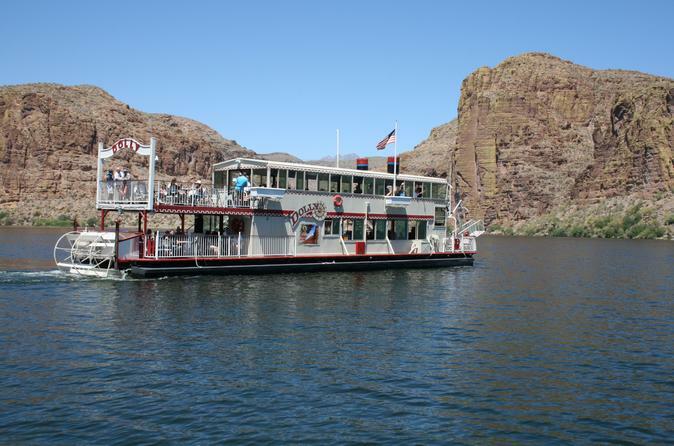 A narrated 90-minute cruise on Dolly Steamboat on the beautiful Canyon Lake is the highlight of this tour. Dolly Steamboat is comfortable, with an air conditioned area for the summer months. Snacks and drinks are available aboard the steamboat. Many times you will see long horn sheep on the hills and eagles flying overhead. Enjoy views of a slot canyon. Bring your camera or cell phone for excellent pictures. Visit Tortilla Flat, a former Old West stage coach stop, which boasts a population of 6 people. Take your time here for lunch and browsing. Have a short desert walk, where your guide will point out the various desert plants indigenous to the Sonora Desert. Admission to Dolly Steamboat is included in the pricing.